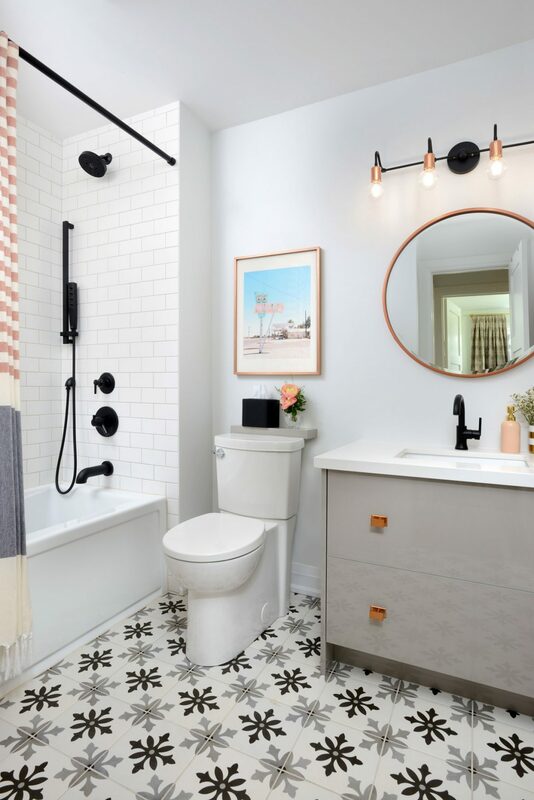 It started with a plan to get rid of the discoloured tile grout in the master ensuite bathroom – and turned into a complete renovation of all four storeys of Alex and Cindy Tsen’s North York townhouse. Storage was added to the entry foyer with new closet space. 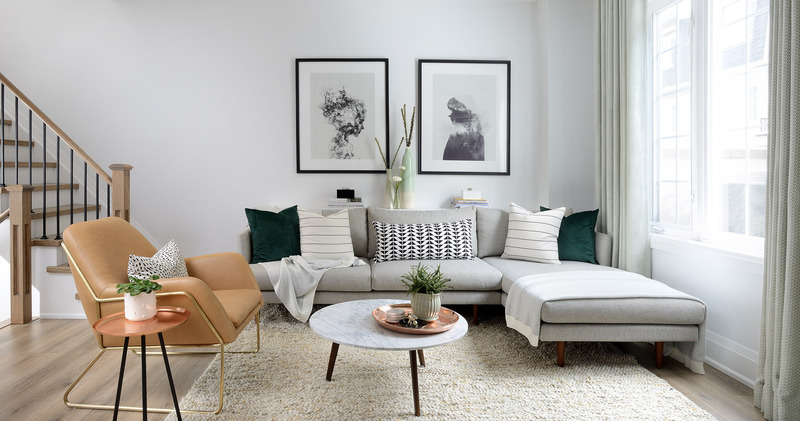 The living room was given shelving and a built-in space for a television. 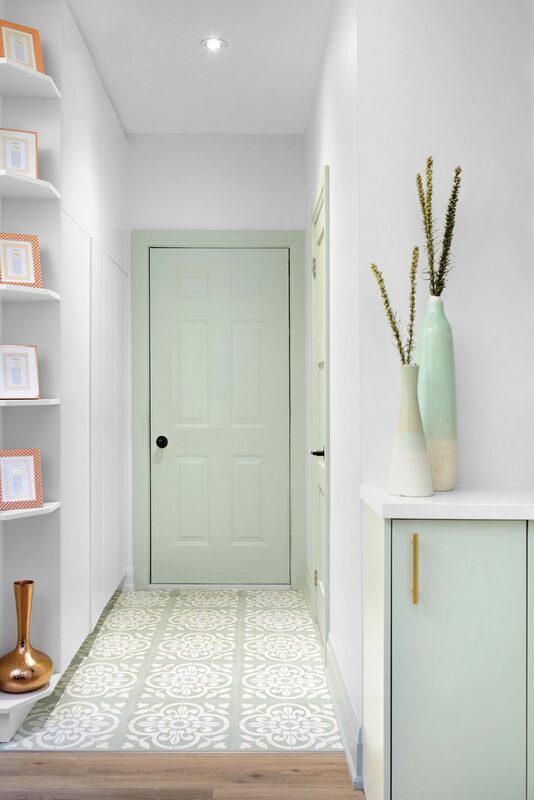 Front entry tiles: Saltillo Tiles; custom drapery and ottomans: Tonic Living. 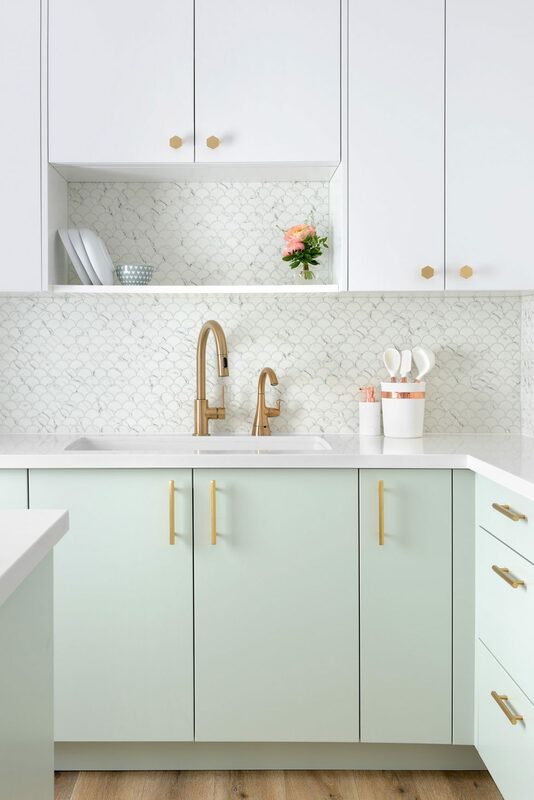 The lower cabinets are finished in a minty green colour, which is a favourite of homeowner Cindy Tsen. The table was a piece the Tsen family already owned; it was transformed into a pedestal table. 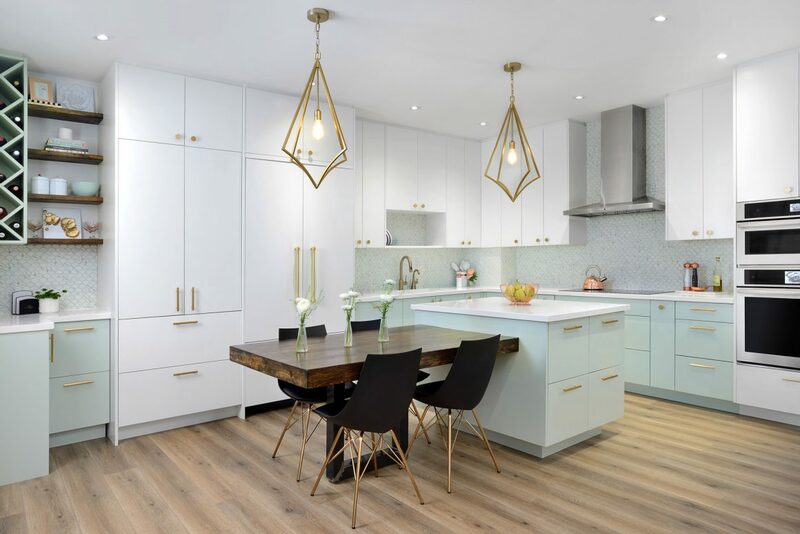 Chairs: Wayfair; pendant lights: Elte MKT. The couple bought the 1,500-square-foot home 10 years ago, but with two daughters now aged 5 and 8, decided they were outgrowing it. They had been hunting for a larger home but, daunted by the high cost of detached houses in their neighbourhood, they gave up. 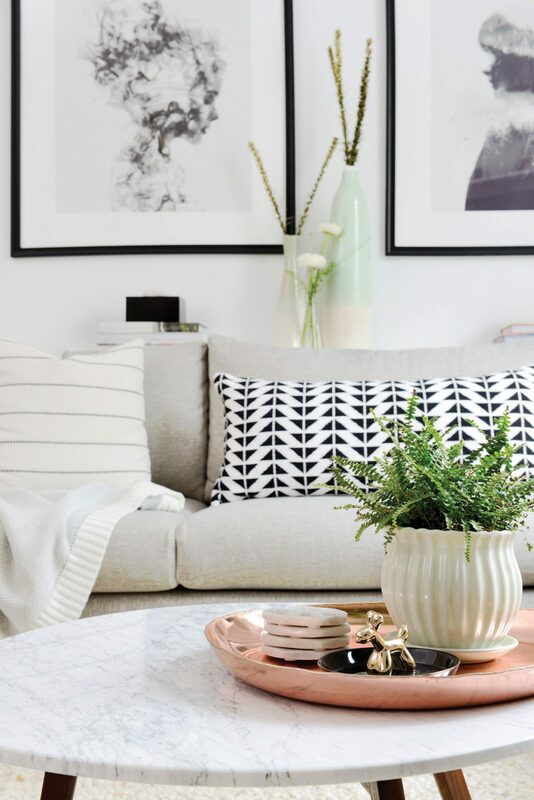 Instead, they decided to stay and turn the house they had into their dream home. On the practical side, that meant creating storage, lots of it, to maximize space. On the design side, it meant having fun with colour. “I didn’t want just white,” says Cindy. “I was not afraid of using colour.” Her favourite is one that her interior designer, Michelle Berwick, the owner and principal designer of Michelle Berwick Design, calls “minty sage green.” It can be seen all through the open-concept main floor kitchen and living area, starting with the front door and patterned tiles in the entryway. The same colour was carried into the kitchen for the lower cabinets. It was Berwick’s idea, and is a choice Cindy loves, but doesn’t think she would have been brave enough to use on cabinetry, or even would have thought of using it there, on her own. 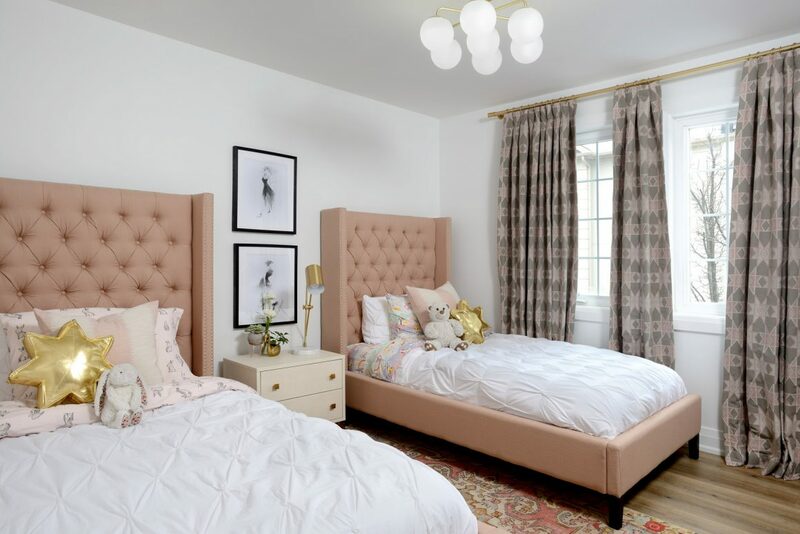 Designer Michelle Berwick granted Cindy Tsen her request for a romantic space by selecting the crystal lighting and the headboard. 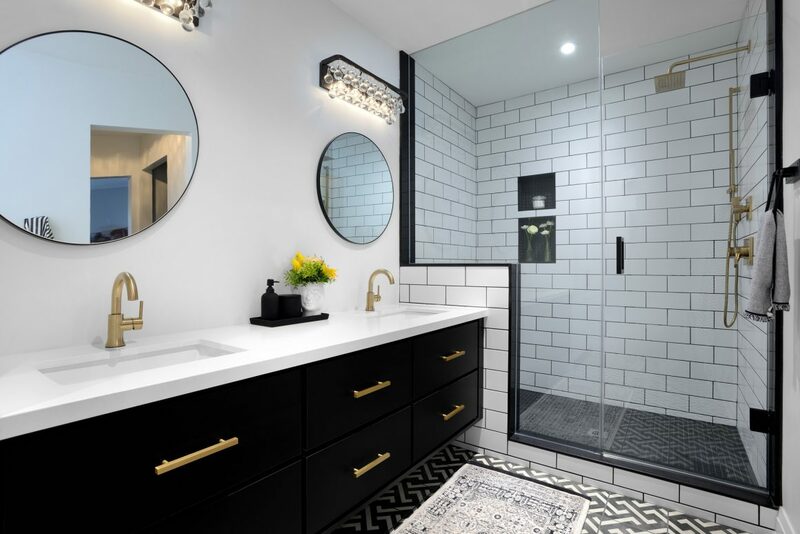 She met Alex Tsen’s request that it be sleek and contemporary by choosing black for the wall and adding a barn door. 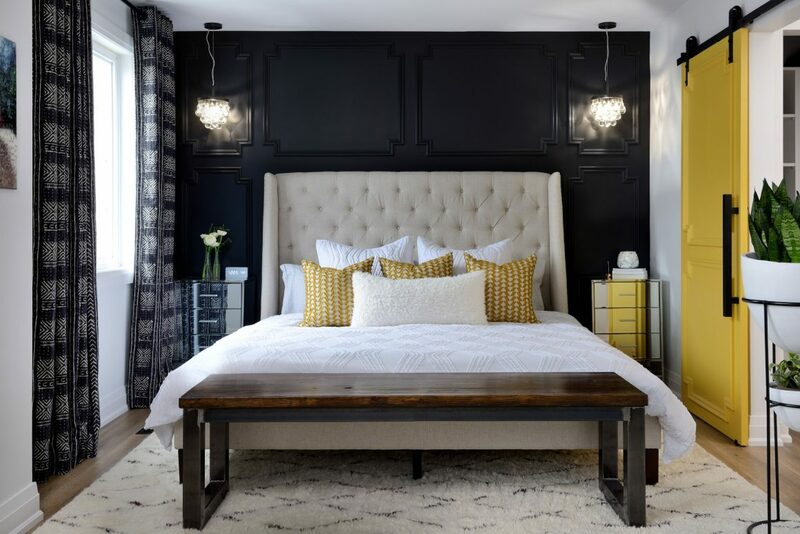 Bedroom and bathroom lights: Matteo Lighting from Niche Décor; headboard: Elte MKT. On the top floor, the master bedroom level, Berwick proposed painting the wall behind the bed black, and adding a yellow barn door to the ensuite bathroom. “She gave us visuals. 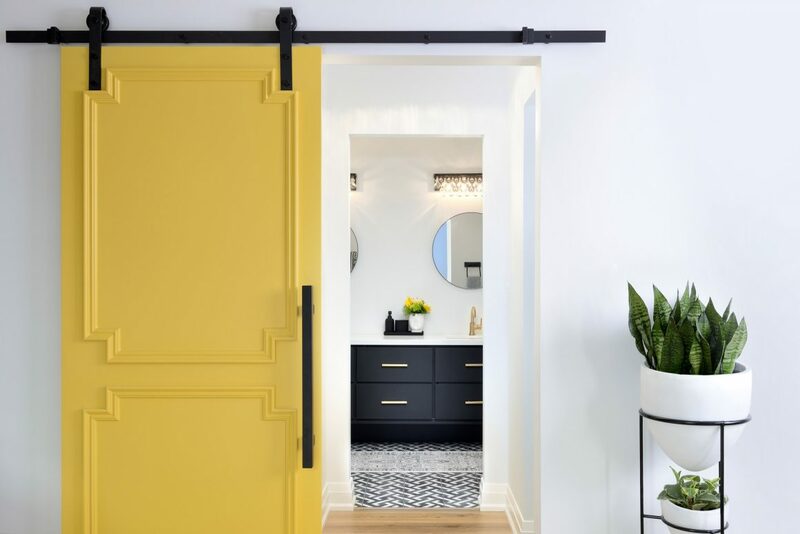 It helped make the decisions easier when she showed us a black wall with the kind and colour of headboard we were looking at, and with a yellow door,” says Cindy. 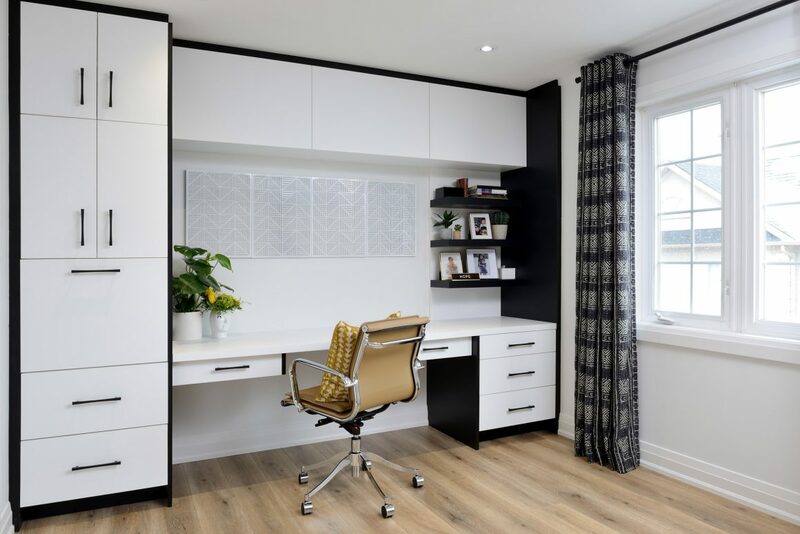 The other big change on the master-suite floor was the creation of an office area for Alex, who works at home. Previously, he says, the room was dark and dingy, his work space small and cramped. 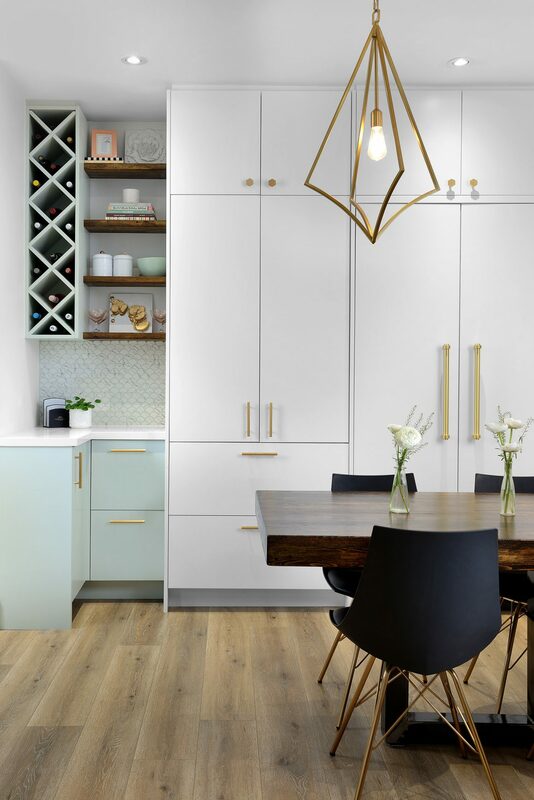 Contractor Kim Cordeiro says she and Berwick worked closely with the couple to ensure that all the pieces they designed would best use the available space, but that it was especially important when it came to that office for Alex. “He likes everything out of the way, doesn’t like clutter. We worked hard to get the functionality just right,” says Cordeiro, a partner in Lavida Contracting. The second floor is the children’s space. Previously, there were two bedrooms and a bathroom, but Cordeiro removed a closet from one bedroom to fit two beds so the girls share sleeping quarters. 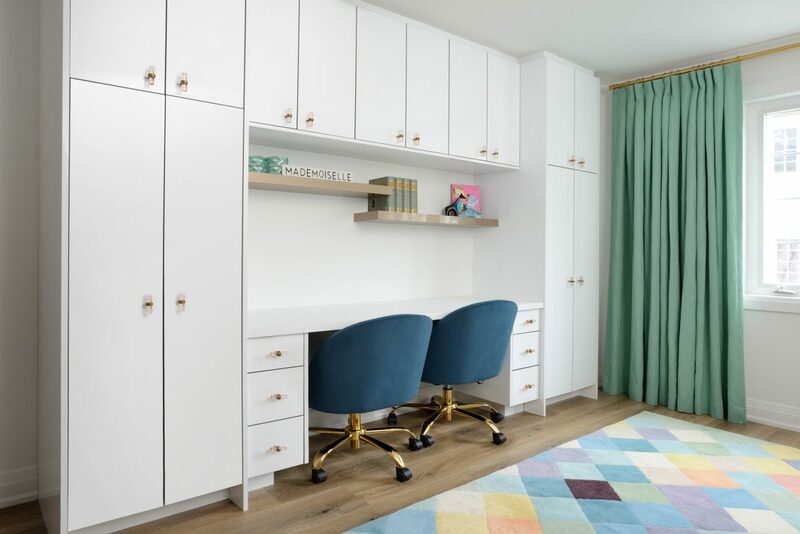 She turned the second into a playroom, with storage and a built-in desk and homework space. If, as the girls get older, they decide that each wants her own space back, it would be easy to rebuild a closet, Cordeiro says. Eliminating one bedroom to create a play space isn’t a typical move, but the Tsen girls were keen to share. The play space includes lots of built-ins for storage. 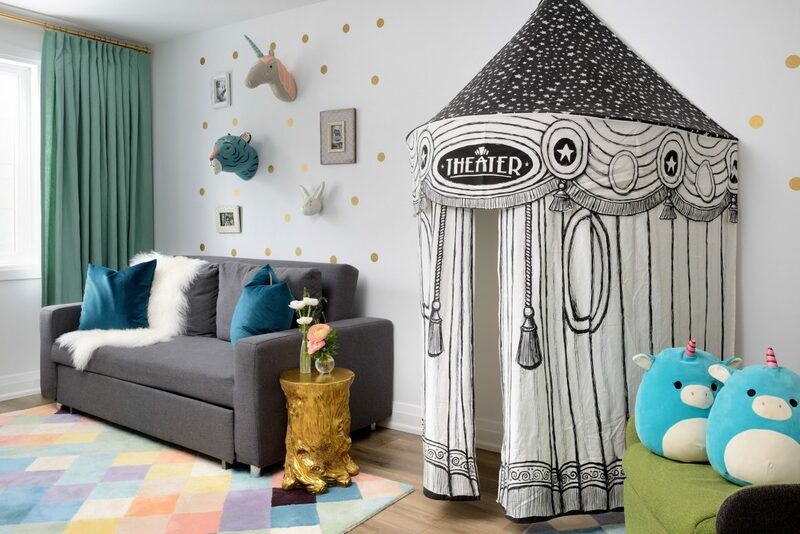 Theatre tent and rug: Crate & Barrel. The other positive side is that it gives both the adults and children separate places to entertain their friends. 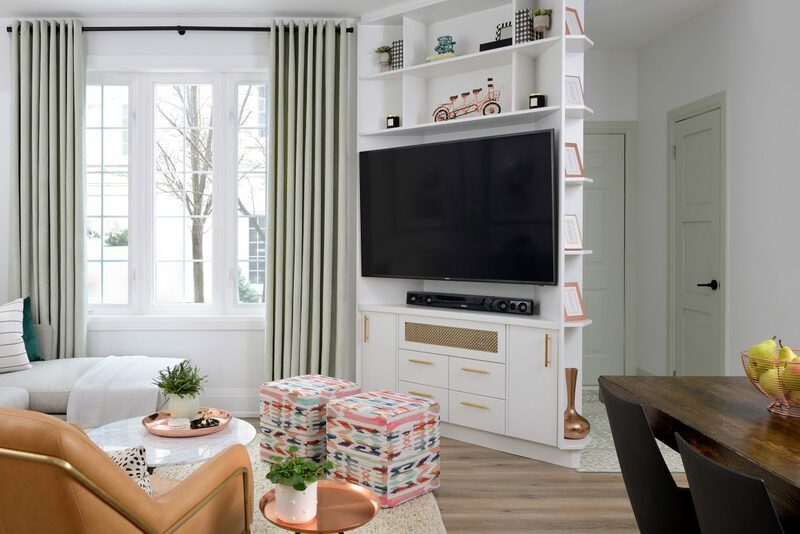 The basement floor leads to the garage and has a laundry room, but its main function is as a storage area, with built-in cabinets through most of the space. Berwick created a loft area over the storage, where the children can watch television.